made this, and uploaded it 5 years ago. I absolutely love Abbey's expression, he looks so cute! Really good composition of the picture. The dark background works well with the colorful foreground. The coloring is very good, too. The painterly style of Abbey's picture and the more cartoony style of the rest. This is awesome. Seems Abbey is doting on Daisy a tad much xD Kind of sad they broke up when they were so good together. I'm not even a fan of Daisy, I just think Abbey is adorable! Well done all round, though. 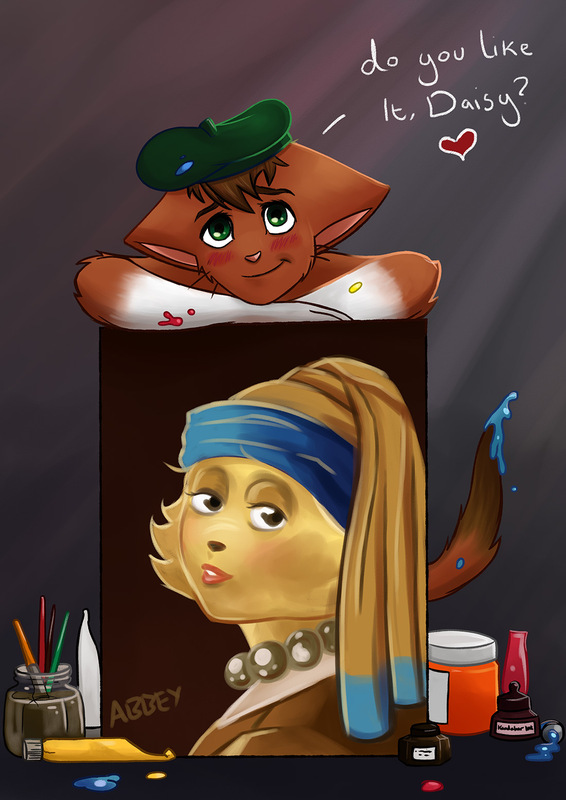 I can't believe that I know what that painting is based off of (Girl with a Pearl Earring)...because of Animal Crossing. the eyes are missing that vermeer touch. a dot magenta in one and a dot of pale blue in the other. Thank you for resizing this for me Suitcase, I was worried about how large it was going to be haha! I really want to see Abbey's artistic side in the comic, I'd love a story where Daisy discovers Abbey has a beautiful creative soul and falls for him, haha! LOL the paint on Abbey's tail reminds me of Smeagle..
Wow, that's gorgeous! I absolutely adore Abbey's expression! I love Abbey's i'm-hopelessly-in-love face. Very very nice picture, you're really good. How that art was done is like the Mona Lisa just look at it. "I look like a 42 year old woman?!?" Comic: The good guy has to win somehow!